Horden CC are pleased to announce D J McGough Ltd have agreed to sponsor the club following the decision from the clubs previous sponsor not to renew their sponsorship. Chairman Wayne Birks was instrumental in securing the deal for the 2015 season. "Im very pleased we have managed to come to an agreement with D J McGough's to support cricket at Horden CC. We hope this is the start of a very long partnership between ourselves and Davey." THE IPL IS COMING TO HORDEN CC! Monday 3rd August will see Horden Cricket Club host a T20 match between Horden 'Pro' Heat and NUSCC Elite. 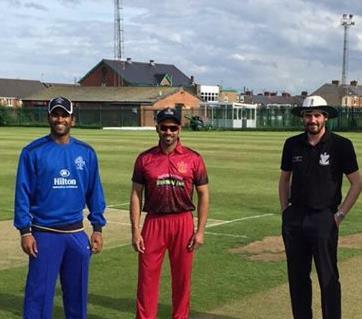 The game is billed as the Patterson T20 Pro Challenge cup in memory of Horden legend George Patterson who recently passed away after a short illness. The game starts at 6pm and comprises a team of local professionals as the Horden Heat playing a select XI from the NUSCC Elite. Horden CC are pleased to announce we have signed an exclusive deal with B3 Cricket to be our teamwear provider for the 2015 season. Existing members will be provided with a new whites playing shirt on payment of the 2015 subs. B3 offer excellent quality equipment at superb prices. Orders can be placed via Adam Dixon or soon via our own club shop (awaiting setup). HORDEN CC ENGAGE NEW PROFESSIONAL! Horden CC are delighted to annouce we have signed Pakistani first class cricketer Lal Kumar as professional for the 2016 season. Lal comes highly recommended and has been a superb pro in local league cricket having had stints at local Hetton Lyons and Great Ayton.